It's Finally Here: The Complete, Living Database of Fire Sprinklers! 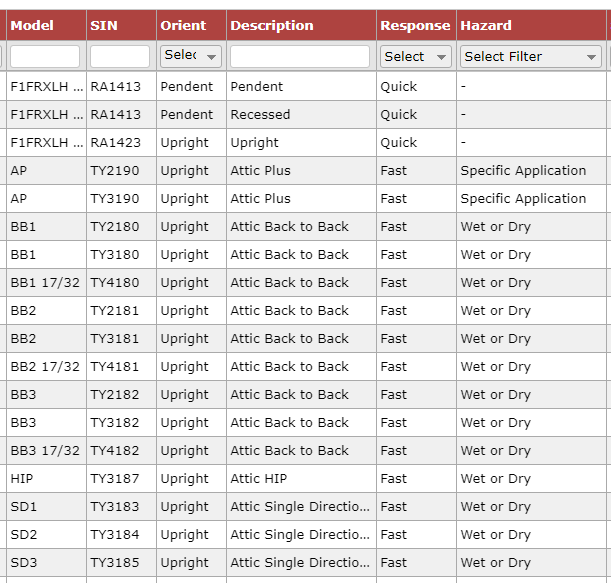 The Sprinkler Database is a living directory of every fire sprinkler currently available in the market place, where you can instantly filter or search by model, SIN, application, orientation, response, hazard, k-factors, thread sizes, minimum pressures, spacing, finishes, and UL and FM Listings. Not only is it a live directory of available products, but it includes hyperlinks directly to manufacturer's websites, product data, CAD and Revit families for each sprinkler. This offers a huge time savings of having to search through as many as six different websites to find the right sprinkler information or detail. The Sprinkler Database is for Designers & Engineers, Inspectors, and Installers. Need see if a concealed extended coverage dry sidewall exists in white? Find out in seconds. Need to see if the TY3184 is UL Listed? See in seconds. Want product data for the RA1413? See it in seconds. What about a Revit family for the Tyco's BB2 Attic Sprinkler? Click to download in seconds. The Sprinkler Database is designed to make you the workplace hero by allowing you to focus on what matters in your job, not wasting time researching multiple websites and filters each time you have a specific sprinkler information need. Get better information on sprinklers in significantly faster time. Sprinklers are introduced to the market all the time. Additionally, products are updated or even pulled from production. The live database keeps track of all the latest additions and offerings so you don't have to. This has been a dream come reality for over a year and a half and I firmly stand behind this resource. If you are not convinced it helps save you time over your first 90 days with it then I'll be happy to offer a full refund. There's of course also an easy unsubscribe, anytime. Order today and we'll include in a downloadable Cloud Ceiling Calculator.